James Grage: Let’s talk about variations on the keto diet. Let’s say that it’s a guy who’s in his mid-twenties to mid-thirties. He goes to the gym five days a week. He wants to build muscle, or he wants to maintain lean muscle and he says, “I don’t want to follow a true ketogenic diet, I want to follow a modified diet. I hear that I can consume carbohydrates around my workout for recovery and muscle size.” Knowing that a lot of cell volume is coming from fluid, which is coming from our body holding glycogen in the muscle, when you deplete the carbs, you deplete the glycogen, you lose a lot of water weight. Most people would be happy about the initial weight loss, but for a guy who’s trying to get a nice pump in the gym, he’ll notice he can’t get the same kind of pump anymore. If this guy wanted to try a low-carb or modified keto diet, but didn’t want to lose his pump in the gym, what’s the answer? Dr. Brett Osborn: I get that constantly here in my clinic. You’re gonna look flatter. No question about it. Bodybuilders have the same problem. You know the deal, they ride that fine line where they’re all glycogen depleted and then they’re playing the game with the Oreos the night before. James: Before they step on stage. Dr. O: Right. So you are gonna come in flat, you are gonna have an issue getting a pump and my usual question is, “Is this about health? Or are you trying to be a professional bodybuilder?” And then they don’t have an answer for me and that’s the talk in this clinic. It is not about aesthetics. The look is a side effect of the health. Period. That said, you can stack your carbohydrates before and after your workout, even though I like it when people train on a fast, and you’ll have that nice pump if that’s what you want. Dr. O: Which is what we recommend. James: …but is he gonna go eat a salad? Is he going to only eat carbs below 20 on the glycemic index? Or for this particular person, is it okay to go ahead and bring in carbs slightly higher on the glycemic index (GI)? Dr. O: I usually tell them no. That’s my recommendation. If they are living on my protocol, which is less than 20, I tell them to look for foods in the 30-40 GI range. In the morning, because I don’t want a high insulin signal at night, right? You want to have a low insulin signal and really enhanced fat burning at night. Train in the morning, then go to that 40 column. James: Give me an example of carbs that fall between 20 and 40 on the glycemic index. Carbs that this guy could consume in the morning, centered around his workout. James: What about grains? A lot of people like oatmeal. Does that fall in the category above that? Dr. O: I think oatmeal is about 55 and people normally go, “I thought oatmeal was really good!” No. James: Just a recap. And I think this is an important point to make because there’s a lot of confusion when it comes to people who want to go to the gym and they want to build muscle thinking that a ketogenic diet is right for them. That’s where I say, “It really depends on what your goal is.” So if you’re this 28-year-old guy and you want to go to the gym and you want to get awesome pumps, a keto diet isn’t necessarily right for you. And there’s nothing wrong with that. If your goal is aesthetics – big muscles, big pump – a low-carb diet isn’t for you. Dr. O: It’s never going to be conducive to building muscle. Ever. You are, by definition, catabolic. What’s happening is that you are generating a relatively muscle-sparing, ketogenic state and all you’re doing is you’re uncovering that muscle. Therefore, you think that you’ve gotten bigger, but you haven’t. 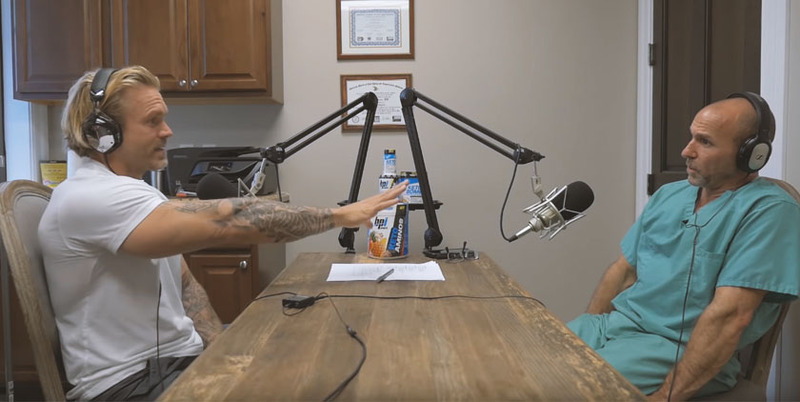 James: For someone out there trying to decide, “Is keto right for me?” If this person goes to the gym five days a week, wants to maintain lean muscle, wants to be leaner, but also wants to be healthier… What can a person expect when it comes to lean muscle, or the aesthetic component? I know I’m gonna be healthier, I know I’m going to train my body to burn fat as a source of fuel, but what am I gonna look like? Can I maintain a certain amount of lean muscle? What is a reasonable expectation? Dr. O: The only time I’ve recommended a classic ketogenic diet is for somebody that is truly obese. For example, I had someone here today that was 50% body fat. 50%! James: So except in this rare case, you never recommend a true, traditional ketogenic diet? James: It’s always modified. So on one spectrum you’ve got a group that’s keeping their carbs on the lower side and also staying on the lower side of the glycemic index (20 and under). You’ve got another group that’s a little more performance oriented and they can go to the higher end of the 100g/day and get into the 20-40 range on the glycemic index, revolving around their workouts. So for that person there, what is reasonable to expect as far as their look? And performance, too. Like a CrossFitter for example. They’re not just doing it to see how many reps they can do; of course they want to look a certain way. Dr. O: Well we have some metabolic trickery that we use here, some “medical technology” that can help with that, but at base level this is all about health. James: And you and I have discussed this a lot. I’ve told you flat out that’s why I’ve never gone to a full blown, all-the-time low-carb diet. That’s why I do cycling – three days of low carbs, three days of higher carbs – trying to find that happy medium where I still get the performance in the gym. But I’m glad you brought this up because there are a lot of people out there who look great. They look like a bodybuilder or a smaller version of it. You see them on Instagram, they’re ripped up, got a ton of muscle and they say, “Hey, I’m on a straight ketogenic diet.” and people are like, “Hey, look at him! He’s on a ketogenic diet! He’s doing it!” So let’s talk candidly about that. People who are maintaining that kind of lean muscle on a ketogenic diet, we know that they’re supplementing their diet with anabolics. Dr. O: Ya, they’re on something else.